Have you ever heard the story of the turtle and the rabbit? The story is that there was a rabbit who thought he was the fastest animal in the forest and he made sure that everyone knew it. He would go around bragging about his speed and his ability to run. Every time he told someone, he would challenge them to a race, just to prove how fast he really was. One day, he was talking to the turtle, and when he challenged the turtle to a race, the turtle accepted! This was too much for the rabbit, and he laughed and laughed. He knew that there was no way a turtle would ever beat him in a race. So, just to make a spectacle of it, he invited all of the forest animals to come and watch the race. Well, the day came, and the rabbit and the turtle got to the start line with all the animals standing around watching and cheering. The bear yelled, “On your marks, get set, go!” and the race was off. So he found a nice, warm patch of grass in the sun, and lay down to sleep. Well, because the sun was so warm and the grass so soft, he slept much longer than he had wanted to. The turtle meanwhile, had slowly and steadily plodded ahead, until, about half way through the race, he passed the sleeping rabbit. He shook his head, but continued on. Right when he was near the finish line, and all the animals were cheering him on, they heard a shout of alarm from the half way point of the race. The rabbit had just awoke from his nap, and had realized that he was about to lose. He got up and raced as fast as he could, but nevertheless, was not able to beat the slow and steady turtle across the finish line. We’ve all heard that before, right? Generally when we hear stories that we have heard so many times before, we tend to phase them out and begin to let out minds wander off to other things. Wendy and I read stories to Taylor every night before bed. Wendy has read most of those stories over 100 times. I have read them far less. And I don’t know how Wendy does, but when I read these children’s stories that I’ve read a dozen times before, I find that even as I’m reading, my mind is off thinking about something else. This often when we read well known Bible stories. Too often, when we come to stories of the Bible that we have heard before, we think we know the story and what it is all about, and so we miss what the story is really trying to get across to the reader. Sometimes, good stories, like the one I just told, get told so often that whenever we hear them, we tend to phase them out so that we cannot hear what it is trying to tell us. The book of Jonah is just such a story. All of us have heard it. We know how God wanted to send Jonah to Nineveh, but Jonah ran from God, got swallowed by a big fish, and then finally went anyway. He preached to the people of Nineveh, they repented, and God saved the city from destruction. That’s the story we’ve been told, and that’s the story that we think we know. Missionaries often talk about Jonah, and so we think that Jonah is a book about missions. In way, Jonah is about missions because Jonah does go on a missionary trip… of a sort. And he does tell the people of Nineveh the message that God wants them to hear. So the book of Jonah is a story about Missions, but not in the way that most of us think. Before we dive into the book, let me provide the historical setting of Jonah. Jonah is a prophet in Israel in the 8th Century B.C. It was a good time for Israel. In fact, Jonah was a well known and well-respected prophet. Jonah had prophesied that Israel would expand her boundaries, and look, now it had happened! There was excitement in the air. Maybe now God was going to bless Israel and let it finally become the most prominent nation in the known world. Maybe now, after all these years, Israel would at last receive the promised inheritance. Jonah’s prophecy might be just the start. On top of this, Israel was in the beginning stages of an economic boom that had not been known since the reign of King Solomon. Money was pouring in from all sides. People were getting rich. And after all, isn’t money a sign of God’s blessing? (Read the book of Amos, which was written during the peak of the economic boom, if you want to see what God thought of Israel during this time). So Jonah was a celebrity. He had strong nationalistic tendencies, and on top of being patriotic, he had God on his side! Jonah was a prophet of God, and God was using Jonah, so they thought, to give Israel everything it had ever wanted. There was only one real problem during this time period. Israel was a great nation, but over in the east, across the desert, another nation, Assyria, was beginning to grow strong. In fact, it could be argued that Assyria was just as strong and rich as Israel. In a sense, Assyria was Israel’s competition. They were rivals. If either one grew too much more, it would be war, and only one nation would survive. The capital city of Assyria was Nineveh. This all brings us to the first verse of Jonah 1. This phrase appears twice in the book, here and at the beginning of chapter 3. In each case, we see God giving Jonah a command, and in each case we see Jonah responding. The command of God to Jonah is in Jonah 1:2. In light of all that you know of wicked nations in the Bible, if you were a Jewish prophet and God told you this, what would you be thinking? I would be thinking, “All right! It’s about time God. Those people over in Nineveh are horrible. Have you heard what they have been doing to some of their prisoners? They torture people and destroy whole nations of people.” If I were Jonah, I would be thinking about the wicked nations at the time of the flood. For My Angel will go before you and bring you in to the Amorites and the Hittites and the Perizzites and the Canaanites and the Hivites and the Jebusites; and I will cut them off. You shall not bow down to their gods, nor serve them, nor do according to their works; but you shall utterly overthrow them and completely break down their sacred pillars. So knowing how God has dealt with wicked nations in the past, if I were Jonah, I would have packed my bags and left for Nineveh that night. If I hated Nineveh as much as Jonah did, and if God told me that it was an incredibly wicked city, and that God wanted me to go and preach fire and brimstone to them, I would have left in a heartbeat. But Jonah does something very peculiar. When he should be leaping for joy and heading for Nineveh, he heads the opposite direction. Jonah 1:3. But Jonah arose to flee to Tarshish from the presence of the LORD. He went down to Joppa, and found a ship going to Tarshish; so he paid the fare, and went down into it, to go with them to Tarshish from the presence of the LORD. God says, “Get up and go,” so Jonah got up and… ran away? When the prophet Jonah fled from God’s instruction to go to Nineveh, he boarded a ship bound for Tarshish, in the opposite direction from Nineveh. What? Why would Jonah go in the opposite direction if God had told him to go preach fire and brimstone against his hated enemy? Think of someone you hate. Someone you despise. Someone you just can’t stand. Are you thinking of someone? Let’s go from a different perspective. Have you ever been driving down the road, and some maniac driver comes barreling up behind you and he tailgates you for two miles before finally passing you? As he does, he flips you off, then cuts you off, and goes speeding down the road. When that happens, all of us secretly hope that another few miles down the road, we see that guy either pulled over by a cop or broken down on the side of the road. It has never happened to me, but I imagine myself waving to him and smiling as I drive by. Now imagine that you both had cell phones, and as this guy sped off, God spoke to you and told you the guys phone number and then told you to call him and tell him that he is going to get a ticket. Wouldn’t you do that? I probably would. But Jonah does just the opposite. Instead of heading to Nineveh to preach gloom and doom, he goes to Joppa and heads in the opposite direction to Tarshish. The text says that Jonah fled from the Lord. Jonah knew, as we all should, that we cannot flee God’s presence. He is everywhere. Jonah was not trying to get to a place where God could not see him. Fleeing from God was Jonah’s way of telling God he didn’t want to obey Him. Jonah was unwilling to obey God. And so he fled for Tarshish. This is an understandable response when God asks us to do something difficult. Like tithe of our money. Like read our Bibles. Like pray. When God asks us to do these sorts of things, most of us head the other direction. But if God asked one of us to go pronounce impending judgment on Al Queda, most of us would be on the next plane to Iraq. So Jonah went the opposite direction, and we still don’t know why. But now we have another question. Jonah, a prophet of God, is now in blatant rebellion against God. So what is God going to do? We know that God doesn’t like disobedience. Verses 4-5 answer this question. Jonah 1:4-5. But the LORD sent out a great wind on the sea, and there was a mighty tempest on the sea, so that the ship was about to be broken up. Then the mariners were afraid; and every man cried out to his god, and threw the cargo that was in the ship into the sea, to lighten the load. So God sends a storm. This storm was not a coincidence. It was sent by God. It is described as a great wind and a violent storm. Sailors from Tarshish were expert sailors. They were not amateurs. And yet, this storm was so bad, they were terrified. So terrified, that they began to throw their cargo overboard! Their cargo was gold, silver, iron, ivory, probably some jewels, spices and exotic animals. Sailors wages depended on getting their cargo to the place they were taking it. If they threw out the cargo, they throw out their salary. These sailors were so scared they feared for their lives. It was the perfect storm. Did you see that movie? It’s not a great movie so let me spoil it for you. The fishermen all die because they refuse to lose their fish. It’s similar here, but these sailors make the opposite choice. If they keep their cargo, if they keep their only means of making money, they will all die. Riches are no good to a dead man. So they do the only thing logical: they toss the cargo overboard. But this is not all they did. Not only were they tossing out their cargo, but they were also crying out to their gods for deliverance. They were praying to their gods. We had one question: Why was Jonah disobeying God? We still don’t have an answer to that. We had a second question: What was God going to do about Jonah’s disobedience. The answer? He sent a storm. A big storm. Now we have a third question. If this storm is so bad, the veteran sailors are praying to their gods, is Jonah praying also? If these Gentiles who don’t even know the true God are praying, then what would a genuine prophet of the only, true and living God be doing? The rest of verse 5 reveals all the details. But Jonah had gone down into the lowest parts of the ship, had lain down, and was fast asleep. Jonah’s downward spiral is almost complete. In Jonah 1:3, Jonah had gone DOWN to Joppa, where he went DOWN to a boat. Now, in the face of a life threatening storm, Jonah goes DOWN into the bottom of the ship and lays DOWN to fall into a deep sleep. Does Jonah wake up and pray? No, he does not. Even though all the sailors call on their false gods, and even though the captain pleads with Jonah to call on his, we do not see him doing so. It seems that Jonah does not care if they all die. It seems that Jonah wants to die. What is going on? Why does he want to die? We’re not told yet. The next things to happen is that the sailors resort to an Ancient Near Eastern practice of drawing straws to see which god is responsible for the calamity. Jonah 1:7. And they said to one another, “Come, let us cast lots, that we may know for whose cause this trouble has come upon us.” So they cast lots, and the lot fell on Jonah. Jonah is singled out as the one whose God is responsible. Again, not a coincidence (Prov 16:33). He tells them the people he is from and the name of his God. The name in Hebrew is YHWH. In your Bible, the word LORD is in all capital letters. This signifies the word YHWH, the proper name for the God of the Hebrews. Jonah also tells them that this YHWH created the sea and the land. And if he created it, the suggestion is that he can certainly cause a storm like this. Jonah 1:10-11. Then the men were exceedingly afraid, and said to him, “Why have you done this?” For the men knew that he fled from the presence of the LORD, because he had told them. Then they said to him, “What shall we do to you that the sea may be calm for us?” for the sea was growing more tempestuous. If they were not terrified enough by the storm before, they are now even more terrified. Before they thought that maybe if they threw the cargo and livelihood overboard, then maybe they would escape with their lives. But now all hope seems to vanish. The God, YHWH, who is causing this storm, created the sea and the land and was out to get someone who was on their boat, and the sea was getting rougher and rougher. Can you feel the tension growing? And so they ask Jonah, “Is there nothing we can do to appease your God? Is there nothing we can do to so that He might spare our lives? We do not want to die for something you have done.” And Jonah answers in verse 12. This is a strange answer from Jonah. Follow the logic. God tells you to go to Nineveh. You don’t want to do it, so you run away. Instead of going where God wants, you go on a vacation cruise. God sends a huge storm, which threatens your life and the lives of everyone on board. The crew finds out the storm is because of you, and they ask what can be done about it. What is the logical answer? It sounds like Jonah would rather die than go to Nineveh. He wants to die in blatant rebellion against God. Would it be suicide if he died in the sea? We do not know if he could swim or not, but in a storm like this, it would not matter. Throwing a man into a storm like this is essentially putting that man to death by drowning. Again, we see that Jonah wants to die. What is more surprising still is looking at this from the viewpoint of the sailors. They were pagan, Gentile idol worshipers. Two of the deities they worshiped were the god of the sea and the god of the storms. Sailors, since they spent a lot of time at sea, and often had their lives threatened by storms, often worshiped the sea god and the storm god. Also, one thing that many pagans were involved with idol worship in was human sacrifice. To the pagan, idol worshiping sailors, Jonah’s suggestion sounded a lot like human sacrifice to YHWH. If he was in charge of the wind and the waves, the sea and the storm, and he could be appeased by throwing one of His followers to his death in the sea, then that was human sacrifice. So now, not only is Jonah is blatant rebellion against God, he is not praying to God, he would rather die than obey God, he is now teaching heresy and false theology. There are many people out there who teach that Christians cannot sin very much, and if they do sin, it is not very often, and not any of the “big” sins. But in light of Jonah, we have to say that either he is not saved, or that idea that some people teach is just flat out wrong. I have never heard anyone say or read anything that suggests Jonah was not a believer. The truth is, Christians can backslide, and sometimes quite seriously. Jonah is teaching false theology to these sailors. He is teaching them that to appease God, they had to perform a human sacrifice by throwing Jonah into the sea. They sailors are a little hesitant to do this, so in Jonah 1:13 they try to row back to land. Jonah 1:13. Nevertheless the men rowed hard to return to land, but they could not, for the sea continued to grow more tempestuous against them. They cannot make it to land, and the sea gets wilder. So they finally do what Jonah asks. But first, they do something rather surprising. Jonah 1:14-15. Therefore they cried out to the LORD and said, “We pray, O LORD, please do not let us perish for this man’s life, and do not charge us with innocent blood; for You, O LORD, have done as it pleased You.” So they picked up Jonah and threw him into the sea, and the sea ceased from its raging. Before they throw Jonah overboard to his death, they pray to YHWH. They know He is in control of the storm, and hope that he does not hold them accountable for killing one of His children. And still, event though the sailors are Gentiles, they are praying to YHWH when we still have not seen Jonah do so. They are obeying a God they know nothing about when Jonah, who knows a lot about YHWH, lives in disobedience and rebellion. In response to their actions, in response to their prayer and throwing Jonah overboard, the raging sea grew calm. Jonah 1:16. Then the men feared the LORD exceedingly, and offered a sacrifice to the LORD and took vows. The sailors are saved. God has mercy on the Gentile sailors. The storm grew calm and the sailors’ lives were spared. So they feared YHWH and offered a sacrifice to Him and made vows to Him. Now we should not that they are not monotheists here. They are worshiping the LORD as one of many gods, not as THE GOD. But what about Jonah? Did he get what he wanted? Did he die? No, God had something He wanted for Jonah, and he was not going to let Jonah get off the hook that easy. So God sends a miracle to keep Jonah alive. Jonah 1:17. Now the LORD had prepared a great fish to swallow Jonah. And Jonah was in the belly of the fish three days and three nights. People always think Jonah was swallowed by a whale, but the text says it was a fish. I have heard some people say it was a giant shark, but I watched a few shows on Discovery channel during “Shark Week” and although there are sharks big enough for a man to fit inside, he would not be there in one piece. The way a shark gets food down its throat is by shoving it down with its jagged teeth. Jonah would not have survived being swallowed by a shark. I don’t know what kind of fish it was, but I was in a Red Lobster restaurant this past Friday night, and on the wall, they had a picture of the biggest fish ever caught. It was caught back around the beginning of the 20th century, was about 38 feet long, 18 feet around, with an estimated weight of over 26,000 pounds. I estimate that the mouth on the fish was about four or five feet wide and two feet high, plenty big enough for a man to get sucked in. We don’t know what kind of fish it was that swallowed Jonah. There are plenty of big fish in the sea, and Jonah is not just some fisherman’s tale. It really did happen. And the author tells us in advance that Jonah does not die in the belly of the fish. There at the end of Jonah 1:17, we learn he will only be in there for three days and three nights. Jonah himself doesn’t know this at the time he is swallowed, and so that will play a big part as we study Jonah 2. If you had just been swallowed by a big fish, what kind of prayer would you have? If you can, take a few minutes in the week to read Jonah 2 to see what kind of prayer Jonah had. Let yourself question the text. Are there questions that come to mind as you read chapter 2, remember to only ask questions based on what we know so far from chapter 1. In Jonah 1, we have several lessons. First of all, we have the person of Christ. Did you know that Jesus likes to play hide and seek? In the New Testament, we read that all of the Law and prophets speak of Him. I am convinced that Jesus can be found on every page, and in every story in the Bible. He is sometimes hidden pretty well, but one of our tasks in studying the Bible is to go find Him. Jesus plays hide and seek, and He can be found in several ways in chapter 1. First, like Jonah, Jesus was called by God to go to a people upon whom judgment was coming. But completely unlike Jonah, Jesus went. That is why He came to this earth. To bring light to those who were blind. To bring salvation to those who were living under condemnation. Whosoever believes in Him will not come into judgment, but will pass from death unto life. Second, I remember a time in Matthew 8 when Jesus too was in a boat, during a storm, and He too fell asleep. The others in the boat with him, the disciples, were terrified. Like the sailors in this story, they thought they were going to die. Here, it seems that Jonah didn’t really care whether he lived or died, but Jesus, since He was doing His Father’s will, knew that no matter how bad the storm got, He would not die. Then again, just as the storm calms here, the storm that Jesus was in grew calm as well. But in Jonah, God calms the storm from heaven, when in Matthew 8, God calms the storm from the boat. The disciple is the boat were in awe of Jesus when He calmed the storm, just as the sailors in Jonah 1 were in awe of God. Then finally, there is the statement in Jonah 1:17 that Jonah will be three days and three nights in the belly of the whale. We don’t have to do much looking for Jesus here, but Jesus jumps out and says, “Here I am!” (That is the way my little girl Taylor plays hide and seek). Jesus talks about giving people the sign of Jonah (Matt 16:4; Luke 11:29), which I believe means the three days and three nights Jesus spent in the grave. So Jesus is all over in chapter one. That is one thing we can take away from this chapter. There are two others, both lessons from Jonah. First, Jonah was unprepared to adequately witness to the sailors. As we go through life, there are people who are involved in storms all around us. Maybe Christians are having such a difficult time these days bringing people to Christ, because we are asleep as they battle the storms of life, and they wonder, “I thought you were a Christian. How can you be doing nothing at a time like this?” When your neighbors or co-workers are going through the storms of life, are you taking the opportunity to minister to them and reveal to them the power of the God you serve, or are you sleeping in the hull? Furthermore, when he does get the chance to share some truth with the sailors, the only thing he gives them is some muddled and misleading theology. They ask what they can do to stop the storm, Jonah doesn’t pray or tell them to pray to God, he doesn’t confess his sin, he doesn’t repent, he doesn’t turn the boat around and go home. He tells them to offer up a human sacrifice. Are we ready and prepared to share the good news with those who are searching, but don’t know where to search? I am ashamed to say that we were not ready. I don’t know what we told him, but I do know that we did a terrible job of explaining the gospel clearly. Now I know that sharing the Gospel is simple. Tell people to believe in Jesus for eternal life. It is not just to believe. Everybody believes in something. Belief must have the proper object, and that is Jesus. People must believe in Jesus. Not believe in God, but believe in Jesus. And it is not just “Believe that He died on the cross and rose again.” It is not just “Believe that He is God.” A person must believe in Jesus for eternal life. It’s that simple. Three things: (1) believe, (2) in Jesus, (3) for eternal life. Jonah didn’t share much of anything with the sailors. I didn’t either with the man on the beach in California. But now I am ready and have had opportunity to share the clear and simple message of eternal life several times. Don’t be unprepared like Jonah. Finally, don’t be unprayerful. The sailors cry out to their gods. Then later, they actually pray to the one, true God. But Jonah, instead of praying out to the True God, does not even wake up, and is still sleeping. There are people all around Jonah, headed for death and destruction, and Jonah, who is the only one who can help them to safety, is asleep. And do you want to know why? He was in disobedience. When we are living in blatant disobedience to God, and we know it, one of the hardest things to do is pray. Though out this whole chapter, we see everybody praying but Jonah, and he knows more about God than anyone else in the chapter. When you are having trouble praying, ask God to reveal any sin in your life, ask Him to search your heart, so that you can confess it and repent of it, and get back into right fellowship with Him. And if you know of sin, you must confess it and repent of it, so that your prayer life can continue unhindered. We have not yet seen Jonah pray. This is intentional in the story, because he finally does pray in chapter two. But it is not the prayer we would expect. 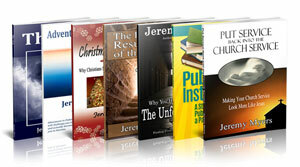 ALL THE SERMONS ARE SO MUCH EDUCATIVE AND INSPIRING.I AM BENEFITED SO MUCH. Thank you Debajyoti. I hope they help in your understanding of Scripture!